Posted by judylobo in Amphibians, Mammals, Nature, Wildlife, Zoo. While at the Central Park Zoo do not forget to go upstairs in the Tropic Zone. It is a happening spot. 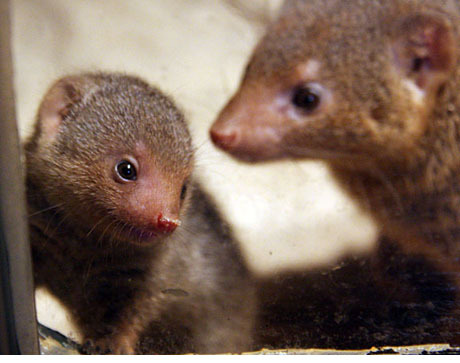 Along with the always delightful Mountain Coatis (Lobo, Zev and Wolfie) you can also see African Banded and Dwarf Mongoose with four babies in each exhibit. Come quickly – they re growing rapidly. Also catch our new Saki Monkeys who reside with two Silvery Marmosets. Don’t forget to catch the magnificent Eurasian Eagle Owl too. If you want to see these photos larger go to here. i LOVE saki monkeys!! What a collection you’re brewing…. the upstairs of tropic zone in and of itself is complete visit!